Credit: CHDI, Inc. and Dake Family Fund. Amsterdam, NL, April 3, 2019 – Since 1993, when the gene that causes Huntington’s disease (HD) was identified, there has been intense focus on understanding how this genetic mutation causes the disease’s severe progressive neural deterioration. In a new study published in the Journal of Huntington’s Disease, investigators have discovered that the HD mutation may alter the interactions of Huntingtin, the large protein produced by the HD gene, with Rac1, a protein that directs changes in cell shape. 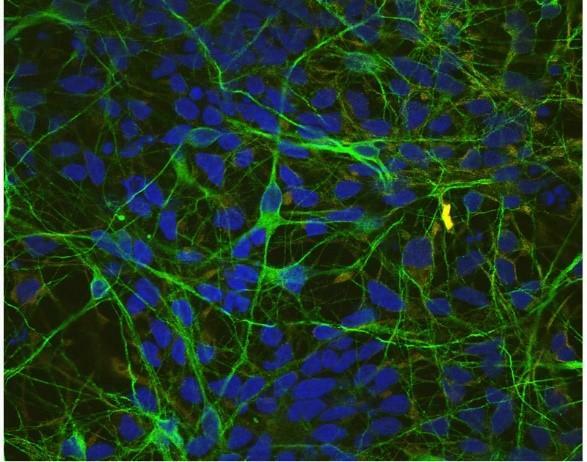 In HD, this interaction may result in abnormalities in the pathway controlling neural cell shape and dendritic growth, which can affect how well nerve cells communicate with one another. “We are excited about this finding because it describes a functional change that occurs very early in HD models, including in human neurons, and might underlie the earliest changes experienced by HD patients. Rac1 is currently a major target of investigation in the cancer field and in Crohn’s disease, so compounds that can modify its function are already being heavily investigated. Thus, we can exploit the knowledge obtained by other clinicians and researchers to help us identify potential early interventions for HD,” explained Kimberly Kegel-Gleason, PhD, Laboratory of Cellular Neurobiology, Department of Neurology, Massachusetts General Hospital, Charlestown, MA.